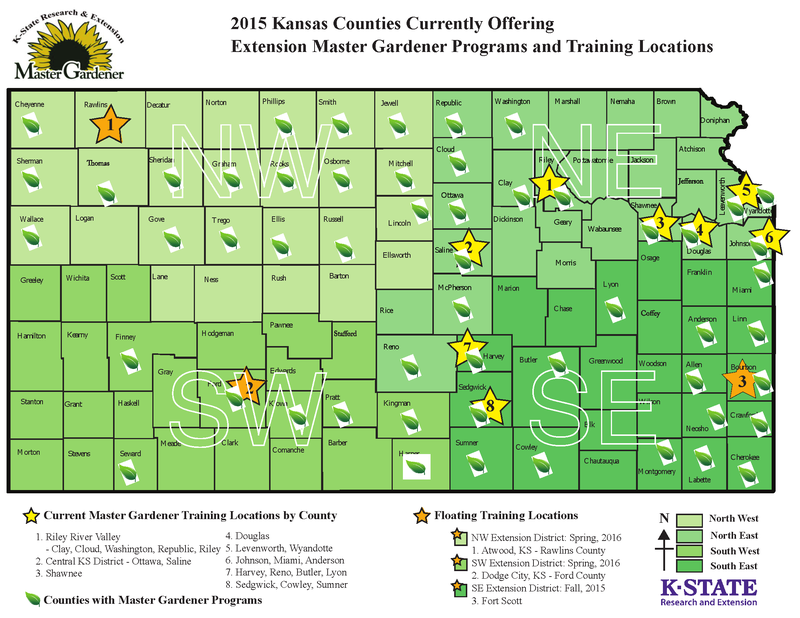 The Master Gardener Program is a Kansas State University Extension program, which provides horticultural training to individuals who then volunteer as Master Gardeners in their communities. Our local program started in 1989. A Master Gardener talks to people about plants and gardening. If you like people and plants and are willing to learn and then share your knowledge with others, you can become a Master Gardener. Trainees receive education on a variety of topics, such as basic botany, soils, fertility, turf grass, landscape management, ornamental trees and shrubs, herbaceous plants, vegetable gardening, indoor gardening, pest management, and plant pathology. After completion of the training, trainees are required to complete at least 40 hours of volunteer service during their initial year as a Master Gardener. Master Gardeners volunteer time to educate and advise the public on gardening and horticulture, and participate in gardening related projects and community events. Anyone with an interest in horticulture can apply for the Extension Master Gardener Program if it is active in your county. If you want to improve your skills and knowledge and you like to work with people, the Extension Master Gardener Program may be for you. You need to be available for about 40 to 50 hours of training your first year. The number of hours required varies with county. The delivery of training (i.e. in-person trainings versus on-line trainings) will also vary by country. You must have at least a High School Diploma or the equivalent. Enjoy sharing your love of gardening with others through various Extension Master Gardener projects. To become a Master Gardener, you will need to contact your local Extension office for more information. Click here (http://www.ksre.k-state.edu/Map.aspx) for the contact information for your county. See this page for a map of counties with active Master Gardener Programs. For current Extension Master Gardeners In-Training, you may access your on-line training modules here. For current Extension Master Gardeners In-Training, you may access your on-line reporting here. Don't have an account for Online Reporting?